About two-thirds of people with major depression never seek treatment, WebMD reports. It often times goes undiganosed or untreated because people don't address it or recognize the signs. So, if you've ever thought to yourself, "Am I sad or am I depressed?" 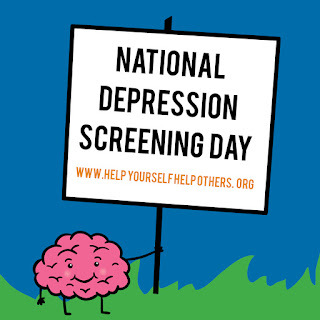 I would encourage you to take advantage of National Depression Screening Day today. On the first Thursday of October each year, Mental Health Screening offers large-scale, anonymous and free mood disorder screenings to the public. Untreated depression is a serious problem that can last weeks, months and even years. It's not something you can "pull yourself out of." Symptoms may become more severe if left untreated and could even contribute to or worsen other medical problems. Other possible side effects include a higher risk of suicide, increased risk of substance abuse, problems maintaining relationships and problems at work. With a diagnosis, a doctor can advise you on treatment options, such as medication or psychotherapy, that will help reduce or eliminate your symptoms. To find a depression screening near you, visit http://www.helpyourselfhelpothers.org. Locally, Easter Seals Michigan, 2399 E Walton Blvd, Auburn Hills, is providing screenings. Their online screening can be found at screening.mentalhealthscreening.org/eastersealsmi. Upon completing the questionnare, you will be immediately provided with results. I was not aware of that. Thanks for reminding me.